tracers and signal injectors engineers could carry around in a shirt pocket. 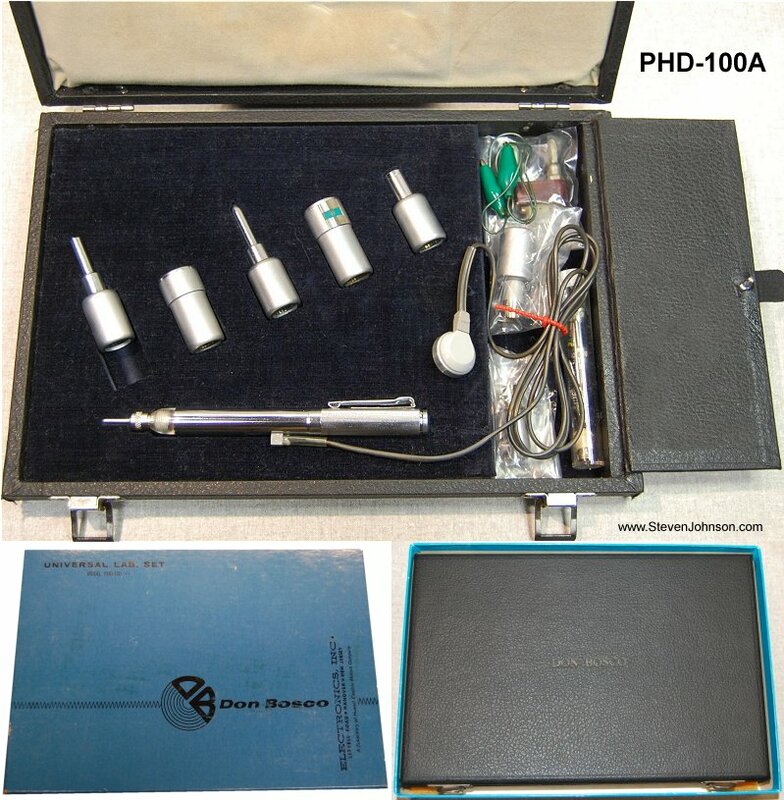 This 1960s Don Bosco sales brochure contains information and specifications on the Universal Laboratory Set model PHD-100, the Stethotracer, Stethotracer Transducers and Accessories, the Vibrotracer model VT-170, and the Mosquito Signal Injector. The brochure also includes pricing. See price table below. 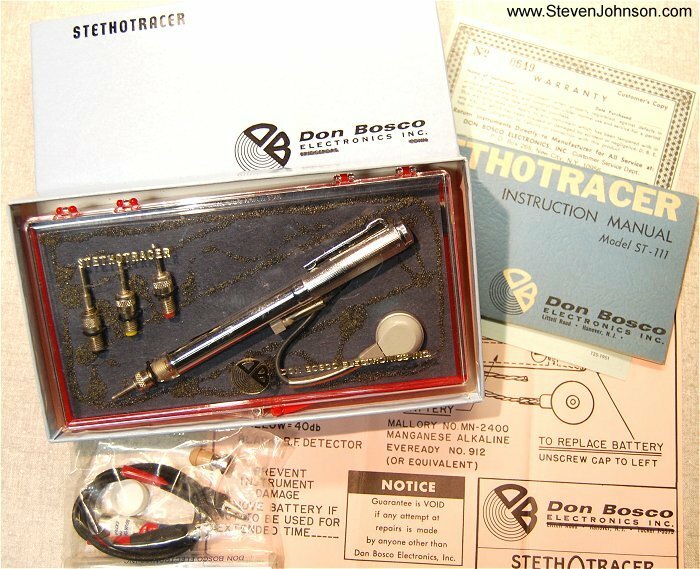 The Stethotracer is a pen sized, self contained signal tracer. It is used to locate and troubleshoot circuits in all types of radios, amplifiers, phonographs, PA systems, telephones, TV audio circuits, tape machines, hearing aids, and more. Both Stethotracer ST-111 kits I have are in plastic boxes (see photo above). The pieces are held in place with elastic cords and accessories are in a plastic bag underneath. Both kits contained a layer of gray foam which has disintegrated over the years. Literature in the first kit contained what I assume to be the original address of Littell Road or 56 Route 10, Hanover NJ. The second kit in some instances had the Hanover address crossed out and a new address of 95 Brewery Road, New City, NY printed or stamped on it. A 1974 catalog I have is printed with 325 Broad St., Bridgeport, Conn. crossed out and ink stamped with the New City, NY address. I also have a packing slip for a Mosquito dated 7/11/1962 using PO Box 323 Hanover NJ. a 1,000 to 2,000 cycle square wave at an audio level and is powered by a single AAA 1.5 V battery. 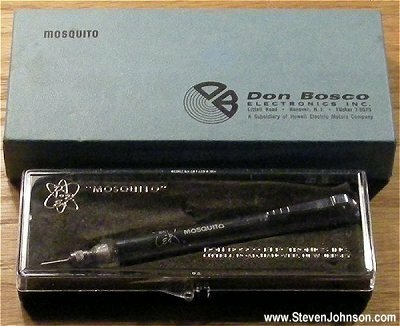 This February 1959 Westinghouse article discusses the use of the Don Bosco Mosquito for tracing signals in transistor radios making this the earliest reference I know of for a Don Bosco product. If you have any of the Don Bosco equipment in good condition that's listed above and you are looking to sell, please contact me. 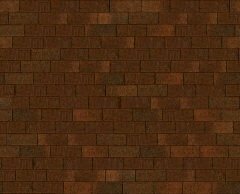 Include photos and description of condition in any emails.